← Private labels – what are they? 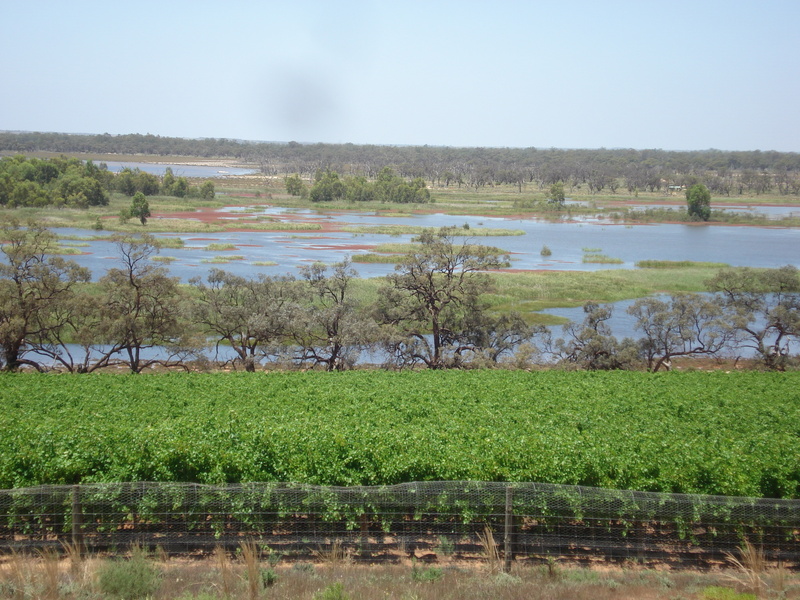 The Banrock Station Wine and Wetland Centre is in Kingston on Murray in the Riverland. For an account of my trip to the Riverland in December 2010 read “Tigs Takes to the Riverland!”. I felt that Banrock Station needed its own blog, since I took so many photos and there is a great tale to tell about the wetlands as well as the winery. As anyone who follows my blog will know, I like to veer off the well-worn wine commentaries and include some unusual and quirky items such as puddings, pies and wine, and bottling wine in an adult winemaking course, as well as the usual winetasting notes and wine news. I always welcome feedback too so feel free, I do read it all. I also like to include lots of pictures as I have the concentration span of a gnat. This blog has more photos than usual because it was that kind of place (apologies for the splodge on some of them – I have since cleaned the lens!). 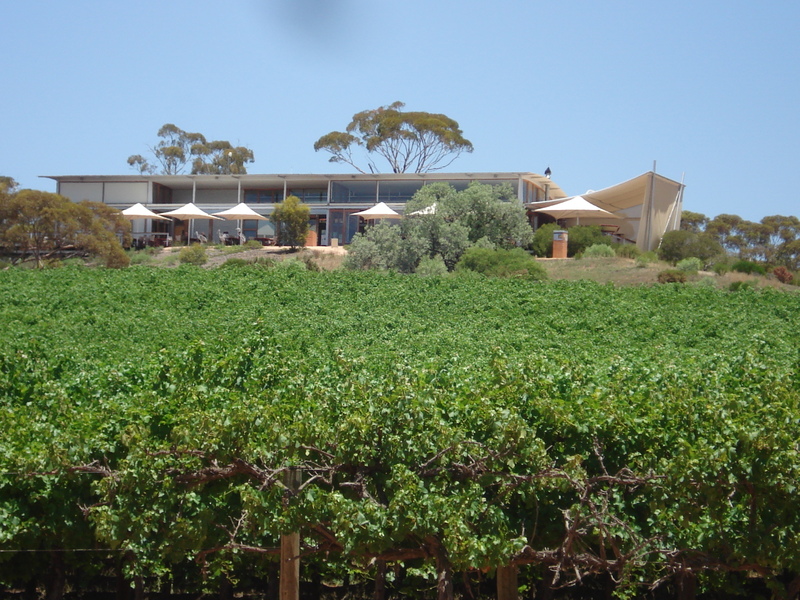 Back to Banrock Station – what a well-thought-out and well-executed venue to appreciate wines, good food, panoramic views, wildlife and relaxation. I loved this place, spending about three hours there and only forcing myself to leave to dodge peak hour Adelaide traffic (I failed). The Hospitality Manager Karen Sellar was keen to hear about the Wine2030 network at the University of Adelaide (my primary reason for visiting) and was extremely informative about the wetlands, telling me that this was the first time it had been flooded to this extent since the centre was opened in 1999. Because of this they had needed to redo all of their brochures for visitors mapping out walks and talking about the wetlands. The new map shows about two-thirds of the walkway for visitors sitting under water, so for safety purposes visitors can only walk along a much shorter section. Some temporary lookouts had been erected at a couple of locations to really take in the event. Karen told me it was the norm to have a managed dry and wet cycle, controlling the Murray River flow to stimulate the breeding of native birds and animals. 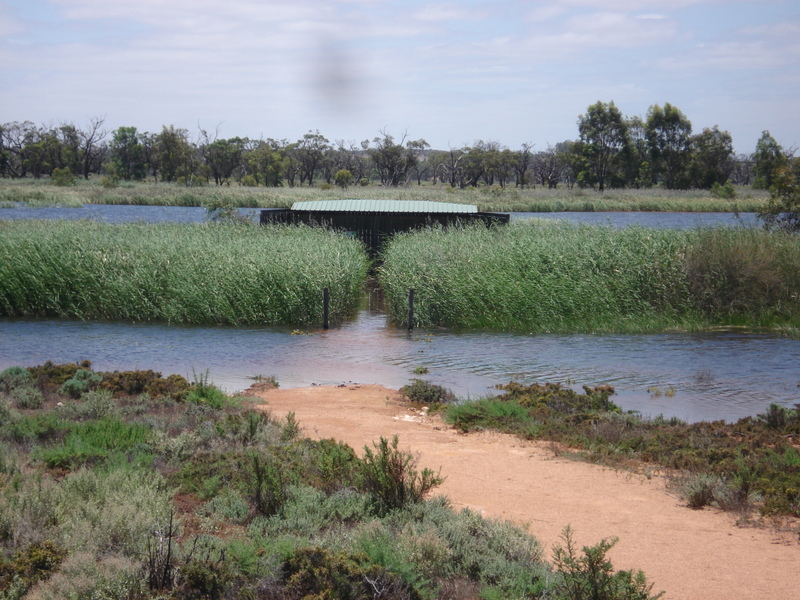 Banrock Station has been managing this wetland since 1994. Flooding is a natural part of the cycle of the wetlands and is necessary for the survival of the ecosystem. The current flows in late 2010 are expected to reach between 65,000 to 80,000 megalitres (ML) per day, compared to drought levels of nearer 2,000 ML/day. The last flood was in 1996, with a comparable peak flow of 76,000 ML/day. However, the current flood is relatively minor by historical standards, as information boards along the walk tell you – in 1956 there was a “1 in 200 year event” with peak flows of 341,000 ML/day. 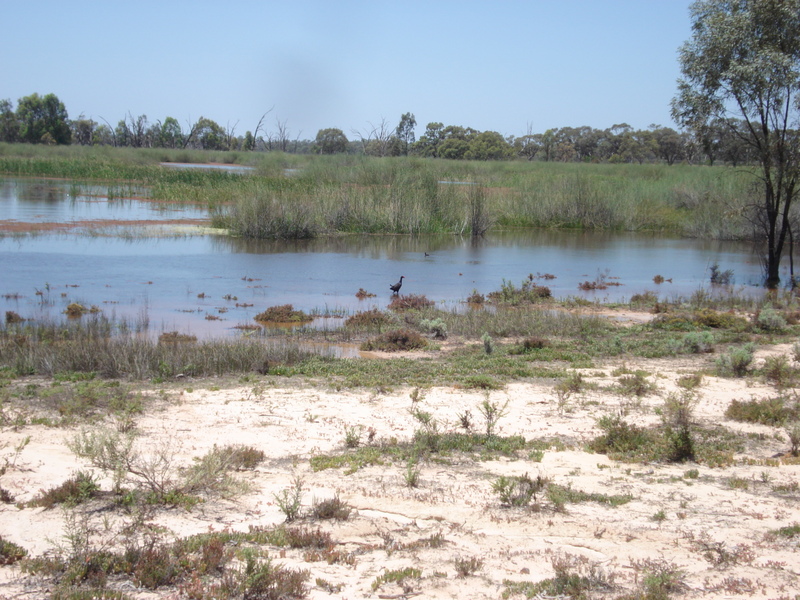 “In 2002, the wetland was listed as internationally significant under the Ramsar Convention on Wetlands, recognising its importance as habitat for threatened species and migratory birds” (source: Banrock Station brochure). The flooding has a number of benefits – there had been concern about the survival of the native River Red Gum trees and Black Box trees and many had been dying as a result of years of drought, but this flood would hopefully save the remaining trees and replenish groundwater for years to come for the many species of trees and plants in the area. The floods are also good to wash some of the salinity out to sea, which also helps the plants and native fish. I took a number of photos – the views were changing daily as the water levels continued to rise. Walking around I saw several species of birds including white heron, black wading birds, various types of parrot and budgies of all colours, black swans, and smaller birds that looked like wren-sized swallows – clearly I am not an ornithologist! There were also lots of dragonflies and lizards (and dastardly flies!) and probably many more species that I did not spot – probably because they spotted me first! The water I am told is also home to many species of frogs and fish. After 1.5 hours of wandering around the wetlands I headed back up to the centre to taste some wines – particularly the ones you can only buy at cellar door – the Mediterranean Collection. There were three red and three white varietals: savagnin blanc, pinot grigio, fiano, montepulciano, tempranillo and durif. Unfortunately the durif had sold out but I did get to try the others and came away with a bottle or three! There was also a limited range of organic wines. Meredith and Chrissy at cellar door were very friendly and knowledgeable ladies. And to round off, here a few more pics I wanted to share. Enjoy! This entry was posted in New World wine, Riverland wine, South Australian wine and tagged Australian wine, Banrock Station, Riverland, South Australian wine, University of Adelaide, Wine, Wine2030. Bookmark the permalink. Thanks for the posting on the trails and the winery tour. Education and a glass of wine, what else can someone ask for?